Lawrence Lessig has 1 media appearance. Event to be held on Wednesday, September 24, 2014, 7PM at the Amato Center for the Performing Arts. The Wadleigh Memorial Library is honored to welcome Harvard Law Professor and one of Scientific American’s Top 50 Visionaries, Lawrence Lessig, as he deconstructs one of the primary concerns of voters across the political spectrum: the corporate corruption of Congress. Lessig details in his latest book, USA is Lesterland, the large majority of campaign donations to political candidates come from a very tiny percentage of citizens -- a percentage approximately equal to the number of people named “Lester” in the United States. He persuasively illustrates how a small number of people actually decide what happens in this country—and what doesn’t. His two most recent TED talks focused on this subject and have been collectively downloaded over 1.2 million times. Professor Lessig’s presentation has been described as “blistering…with rapid-fire visuals” in showing “how the funding process weakens the Republic in the most fundamental way, and issues a rallying bipartisan cry that will resonate with many….” We hope you will be able to join us for this very special evening with one of the greatest minds of our time. Professor Lessig will follow his talk with a book signing. The Toadstool Bookshop will have copies of USA is Lesterland and Republic, lost for sale on site. PLEASE NOTE: this event will be held at the Amato Center for the Performing Arts, 56 Mont Vernon Road in Milford NH and is FREE and open to all. There will be no tickets or RSVPs. The theater seats approximately 400 people; seating will be first come, first serve. Call the Wadleigh Library at 603-673-2408 for further assistance. 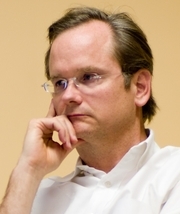 Lessig serves on the Boards of Creative Commons, AXA Research Fund and iCommons.org, and on the Advisory Boards of the Sunlight Foundation, the Better Future Project, and Democracy Café. He is a Member of the American Academy of Arts and Sciences and the American Philosophical Association, and has received numerous awards, including the Free Software Foundation’s Freedom Award, Fastcase 50 Award and being named one of Scientific American‘s Top 50 Visionaries. Lawrence Lessig is currently considered a "single author." If one or more works are by a distinct, homonymous authors, go ahead and split the author. Lawrence Lessig is composed of 2 names. You can examine and separate out names.